When you think of establishments to eat at when you have dietary restrictions, fast food restaurants are usually a big, fat NO. Even if you order a sandwich with no bun, there’s a very good chance the burger has been cooked in (or the chicken sandwich has been marinated in) soy or vegetable oil (which contains soy). The same goes for fries. We don’t regularly eat at fast food places to begin with and even less since Nikki’s diet change. Sometimes, you’re in a pinch, especially when traveling. Or you’re just craving something different. That’s what happened a few weeks ago when trying to decide what to eat for dinner several Fridays ago. The menu is broken down with allergens horizontally and foods vertically. It’s very easy to read and find out what you can eat. The Grilled Chicken Nuggets are not only gluten-, soy-, and dairy-free, but they’re also egg, tree nut-, and wheat-free. The same goes for their trademark waffle fries. Score! I don’t know if you guys have fancy Chick-fil-A’s like the one near us, but ours just got a makeover. It now has two drive thru lines. They also have a person in each line that takes your order via iPad. When we got to our person, we asked what the Grilled Chicken Nuggets were cooked in. The employee asked someone via walkie talkie. The answer: refined peanut oil. Nikki also asked for their famous Polynesian sauce. According to the allergen menu, it’s also free of allergens. Nikki was 99% sure that the delicious nectar actually contained soy, despite what the menu says. After we got our food, Nikki immediately pulled a container of Polynesian sauce out. “I knew it!” proclaimed my sister as she read the second ingredient. Hopefully this saves you from disappointment if you can’t have soy. Eating this food is a pleasure. Side note: I ordered the Chicken Sandwich and Waffle fries. Apparently, I only posted it to Instastory and didn’t save the photo. Welp. If you liked this, you might also like what to order at Wahlburgers, Red Robin, Which Wich?, IHOP, and Ruby Tuesday. As always, sharing is caring. Get social with GFS with the buttons below. I love garlic so I would really love to try out their chicken nuggets as it is marinated with garlic, lemon and salt. Waffle fries look super yummy too. There are my comfort food. Oh dear, poor Nikki. It must be so frustrating to have to always double check what’s on offer. Don’t you wish that someone, like your sus could actually be in charge of what ingredients get used – kinda like the Chief Ingredient Officer 😀 At least that way she and all the other people who suffer from allergies will know for sure. LOL she said the same thing! 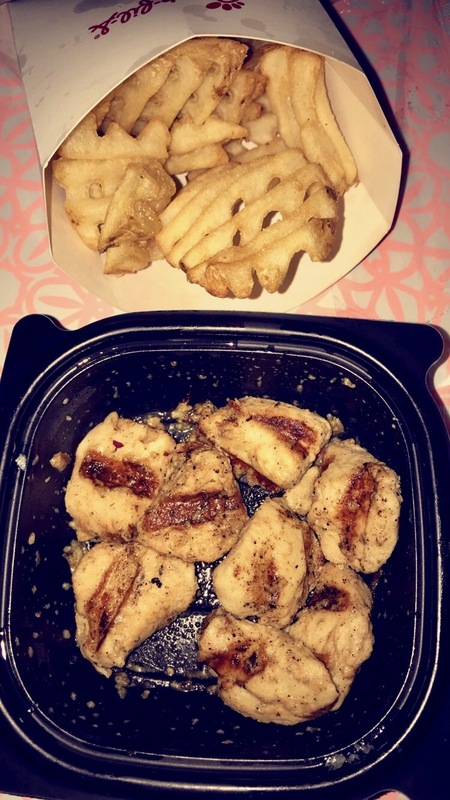 We actually found a brand of frozen waffle fries at the grocery store that she can have and they’re delicious! That’s great that you find a good alternative also in this restaurant! I can’t but notice that you eat a lot of fast food, we don’t eat as much here in Europe. It also shocked me to learn that vegetable oil contains soy! I had no idea! I only use olive oil, which does not contain soy, I know for sure because it is my father-in-law who makes the oil from the olive trees he planted himself. We actually don’t eat much fast food. We had already cut it out for the most part before my sister had dietary restrictions because it’s not healthy. Many of the places that we eat at are what’s considered “fast casual”, but are not fast food establishments. Many restaurants here do use vegetable oil or soybean oil. At home, we cook with olive oil or coconut oil. That’s so nice to get oil from the actual olive trees! Myself a vegetarian so I may not enjoy chicken fries. But surely my friends will savor these more so who have dietary restrictions too. I think its really great you are highlighting places people can eat out with dietary restrictions. It must really help a lot of people out. Kudos to you! Its really great that people with dietary restrictions are having more options. What you do is awesome really, highlighting places where people with dietary restrictions can have s good meal, without any fear of unwanted consequences..